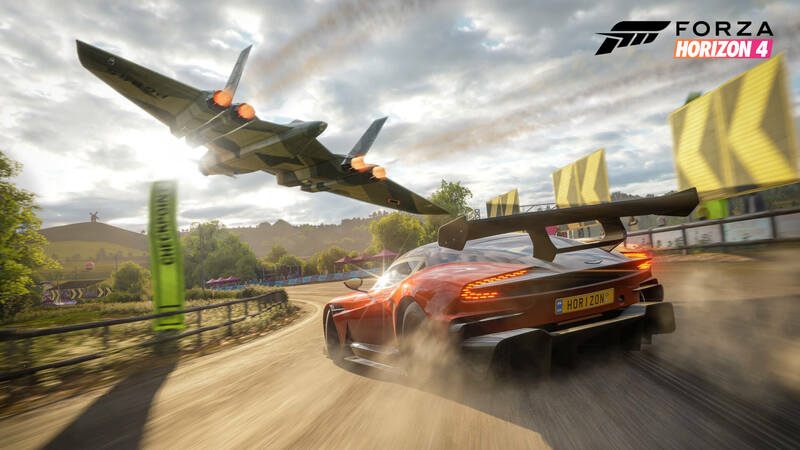 The Series 6 Update for Forza Horizon 4 is slated to arrive later this week, developer Playground Games revealed on its latest in-studio livestream – broadcasted from Leamington Spa in the UK. This latest monthly update for the shared open-world racing game introduces a host of new feature additions and vehicles, including the arrival of the Quartz Regalia from Final Fantasy XV and its Type-D off-roading counterpart, as well as brand-new Seasonal Championships curated towards Street Races and Playground Games. TVR’s legacy is also being celebrated in Series 6 with the arrival of the 2018 Griffith for Car Pass holders and the 2001 Tuscan S as a new exclusive ride to unlock in a Seasonal Championship. 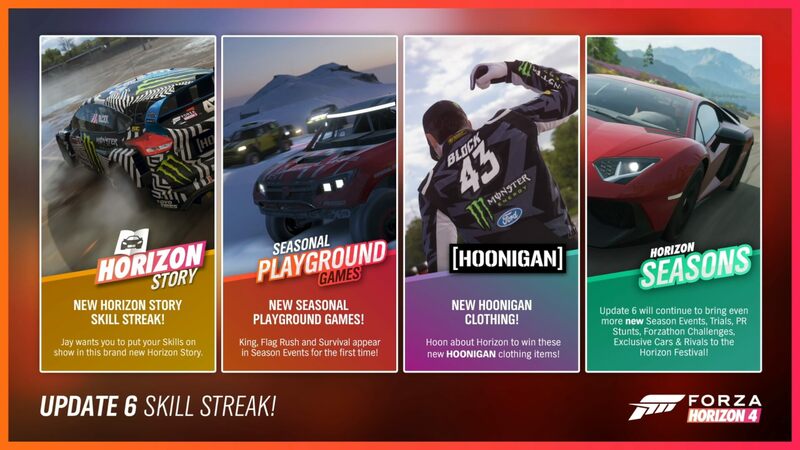 There’s also a new “Skill Streak” Horizon Story for drivers to master, as well as new racing suits to further personalize your in-game character. The Quartz Regalia first appeared in the Forza franchise as a free car to all Forza Horizon 3 players in 2017. It’s one of the biggest cars in the game in terms of its sheer length, coming in at 21-feet, and it saw developer Playground Games work closely with Final Fantasy publisher Square Enix on building the car and bringing it to life in a way that is authentic to the vehicle’s lore. It comes with a V12 engine on the inside and as a change exclusive to Forza Horizon 4, its roof is now down by default to better match the open-world beauty and daylight of Britain. As mentioned above, there’s also an entirely new variant of the Regalia coming to Forza Horizon 4 – the Type-D. This one has been jacked up by a meter on gigantic tires to purely focus on off-road performance and deliver a ride height that’s bigger than any car in Forza Horizon 4’s roster. This 21-foot long Trophy Truck is massive with a huge interior, enormous wheels and large exhaust pipes. To put it all into perspective, the size of one-wheel matches that of the Peel P50. To unlock this variant, you’ll need to already own the standard Quartz Regalia and complete an associated in-game challenge. Beginning on Thursday, February 14th, new dedicated Seasonal Championships for Playground Games in Forza Horizon 4 will become available to compete in with exclusive rewards to unlock. Each of these Seasonal Championships will be made up of five events consisting of Survival, King and Flag Rush modes. These mini-games are typically played as teams with other online players and can be accessed by driving towards the designated arenas marked on the map. Playground Games Seasonal Championships will begin every five minutes and Forza Horizon 4 will automatically matchmake you in once you’ve opted to join. One of the unique quirks of these events is that the developer can choose to layer on vehicle restrictions to make them a fun challenge for participants. 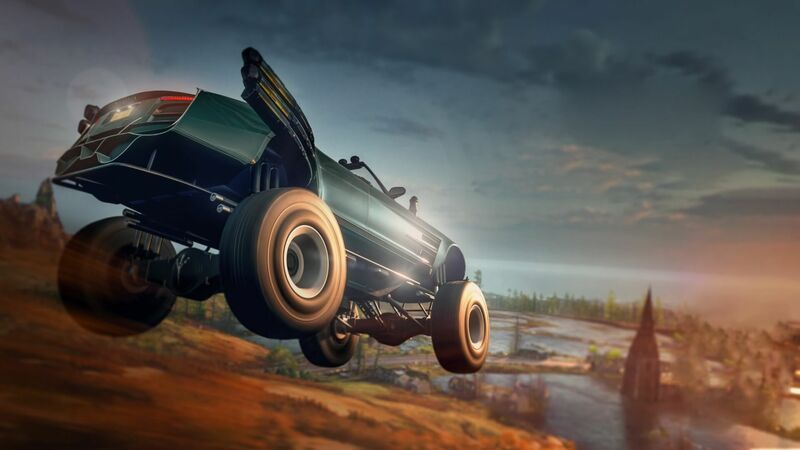 For example, the “Summer Games” event beginning later this week will see drivers in off-road cars set to A Class, whilst the Spring event at Mortimer Gardens, which was noted to be “a particular favourite” of Mike Brown, Principal Game Designer at Playground Games, will feature the BMW Isetta micro car that can also be tuned up to A Class. Previously only available in Horizon Life via either a Convoy with friends or in Online Adventure, these Playground Games events will now be more accessible with a greater incentive to play than before. Rewards for Series 6 include the Volkswagen GRC Beetle and the Lotus 2-Eleven, both of which have been exclusive to wheelspins, as well as the Hot Wheels Boneshaker – noted to be one of the rarest cars in the game as several players missed out on this one when it was first available on the Forzathon Shop. Playground Games also revealed on their livestream that this week will see the final additions to the Forza Horizon 4 Car Pass. These last two rides include the 2018 TVR Griffith and the 1959 Cadillac Eldorado Biarritz Convertible. The Forza Horizon 4 Car Pass has seen two new cars added to the game on a weekly basis over a period of 21 weeks to account for a total of 42 new rides. Whilst the Car Pass is officially wrapping up later this week, the developer aims to continue introducing new cars to Forza Horizon 4, including a mixture of both paid and free cars. New Car Packs were also teased by the developer, as were new exclusive cars that can be unlocked by the entire community in seasonal events and challenges. The upcoming exclusive cars for Series 6 of Forza Horizon 4 content include the 2012 Cadillac Escalade ESV, the 1994 Honda Prelude SI, the 1994 Nissan Fairlady Z Version S Twin Turbo and the 2001 TVR Tuscan S, the latter of which will be available in one of the new Street Scene Seasonal Championships. These events are inspired by street races and the nightlife automotive scene, with flares used in place of standard checkpoint banners and traffic cars enabled. Obviously, these are separate from the other races found in the game and are poised to offer their own rewards. Like all Seasonal Championships, developer Playground Games will be able to curate the types of cars used in these events, with the first to take advantage of Super Saloons. 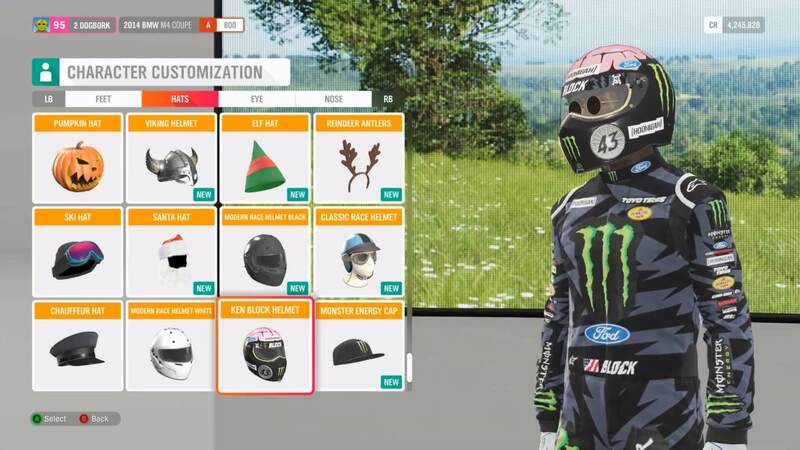 New outfits will also become available to unlock throughout Series 6, including Ken Block’s official race suit and helmet from Gymkhana 10, as well as his iconic Monster Energy Cap – perfect for signing all those autographs. Playground Games is also introducing vintage racing outfits that will be acquaintly matched when cruising around Britain in some of Forza Horizon 4’s most adored classic automobiles, alongside a chauffeur suit and hat for bidding limousine and taxi drivers alike. These outfits will become available to unlock via curated in-game events and the Forzathon Shop over the course of Series 6. Finally, there’s the “Skill Streak” Horizon Story, which focuses purely on driving with style and pulling off skills out on the street. Unlocked at Level 60, this latest set of Bucket List-inspired challenges will see you behind the wheel of cars owned by Jaimin “Jay” Shah, an avid street racer at the Horizon Festival, including the likes of the Porsche 918 Spyder, the Bugatti EB110 Super Sport and Ken Block’s Ford Focus RS RX – the latter of which is unlocked for your garage once you’ve accumulated all the stars available in this Horizon Story. Whilst other Horizon Stories are designed with more a narrative flourish to them, this one is all about the mechanic of earning large Skill Scores before you arrive at the set designated location. Some chapters will also challenge you to acquire a set number of specific skills, too. 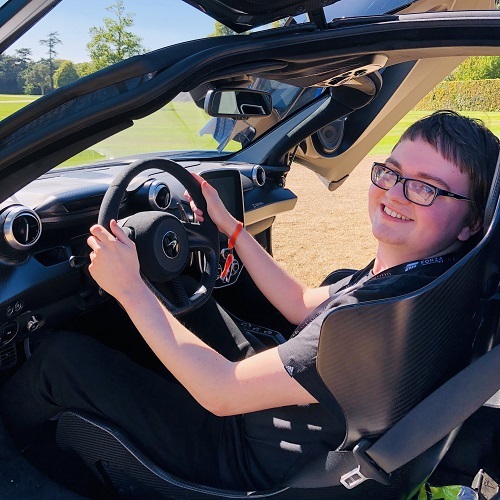 Playground Games says these challenges showcase Jay’s wealth, who acts as the overall ambassador of the Forza Horizon 4 Street Scene. 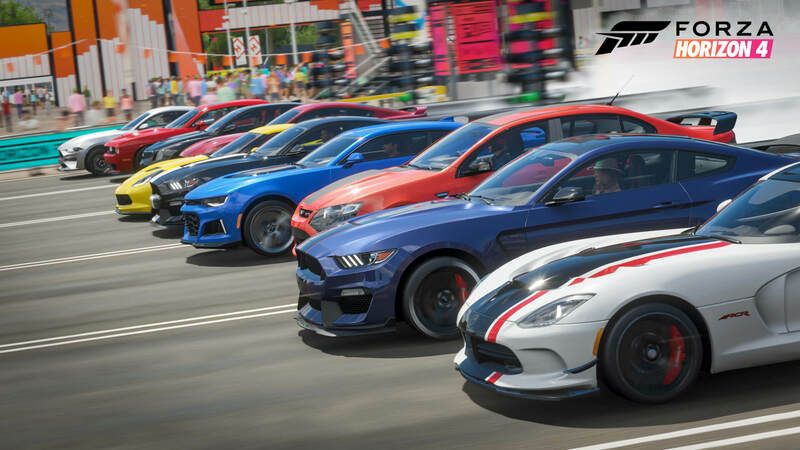 Each of the cars featured have upgrade pre-sets applied by the developer’s own handling team, designing them to drive as pure skill-focused machines. Playground has also tweaked the difficulty in Skill Streak to be more aggressive than in previous Horizon Stories. Not only will you need to be Level 60 to unlock Skill Streak, but the team has also targeted this towards more skilled players, especially those aiming for all three stars in each chapter. Speaking of unlocking stars, another improvement being introduced with the Series 6 Update allows you to track how well you’re doing in terms of chapter progression within each Horizon Story. Not only will you now see the amount of score required for one star, but the game will highlight how far you are from achieving two stars and three stars whilst progressing through each story event. 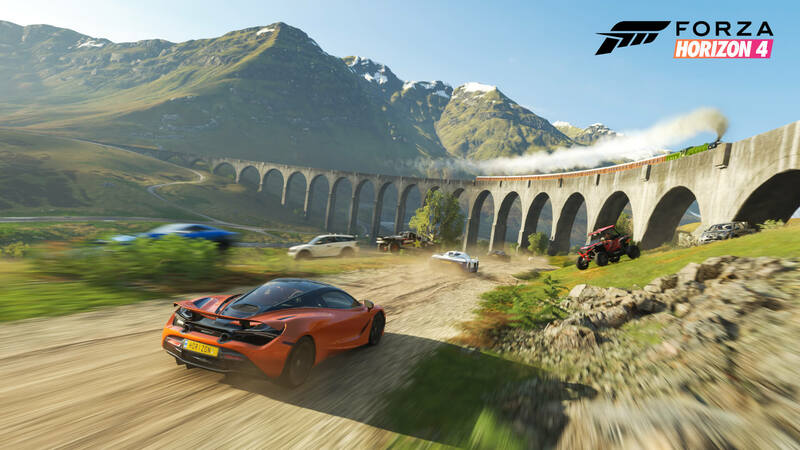 Meanwhile, the Series 6 Update for Forza Horizon 4 also introduces some smaller, but welcomed improvements to the game, including a series of bug fixes that address audio stuttering when resuming from a suspended state, as well as improvements to force-feedback that reduce how powerful the rotation and movement can be from the forces sent to the wheel. You can now also see leaderboard entries for Horizon Stories in the Chapter Select screen without having to replay through an entire chapter. Looking ahead, the team at Playground Games also teased some upcoming additions to Forza Horizon 4 at the end of its latest livestream, all of which are due in the Series 7 Update slated to arrive next month. These include ‘Festival Playlist,’ which is dubbed as “a whole new way to play Forza Horizon 4.” This unique experience is designed to bring together Forzathon, Season Events, Online Adventure and more in one central hub – and it’s a way the developer will also be able to showcase new features and experiences for the game. 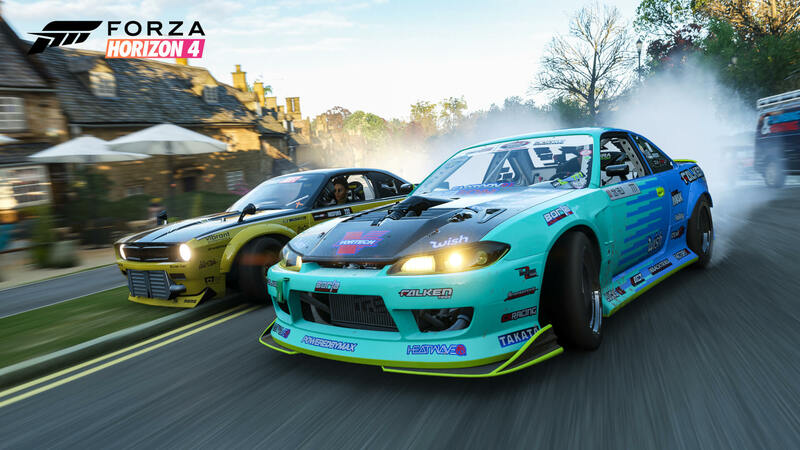 For example, the arrival of Festival Playlist will be accompanied by ‘Showcase Remixes,’ which will encourage players to revisit the Showcases already available in Forza Horizon 4 and re-experience them with a fresh slick of paint using different car and weather scenarios. As noted to us in our interview with Creative Director Ralph Fulton at the Goodwood launch celebration of the game, “Remixes allow us to take the Showcases that are in the game and remix them. Put a different theme on them, put a different time of day, move it out into a different season, change the car you’re in, change the music – and give you the same Showcase but in a slightly different flavour.” There will also be a batch of new Achievements to unlock with the Series 7 Update, as well as a change to wall-riding physics in competitive modes to allow for a fairer online racing experience.